The S 500 Plug-in hybrid, available only in long wheelbase form, is powered by a 333hp V6 biturbo petrol engine alongside a 116hp electric motor that combined, generate a total of 442hp and 650Nm of torque. On purely electric power, this new model can travel over 20-miles before switching to the conventional petrol engine. 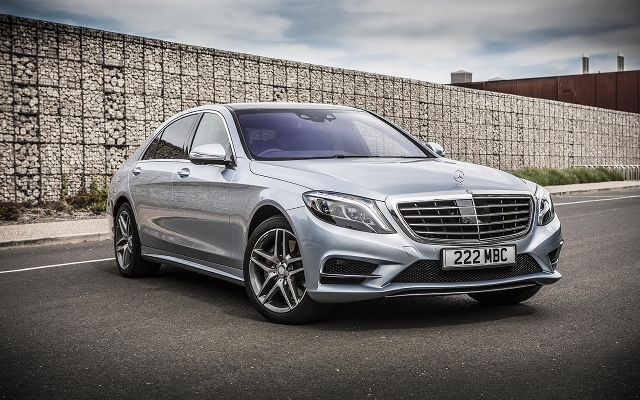 Exempt from road tax and receiving 100% discount of the London congestion charge, on official tests the S 500 Plug-in hybrid returns 100.9 weighted combined MPG while emitting only 65g/km CO2. Running solely on the V6 petrol engine, condition B MPG is around 44.8 (estimated). From rest, it can burst to 62mph in 5.2 seconds up to a limited max speed of 155mph. Unlike Mercedes other hybrid engines (the 300 BlueTEC Hybrid and 400 Hybrid), the 500 Plug-in hybrid can be topped up using available charging devices. A typical full charge on public, three phase power points takes around 2 hours. Specification on the S 500 Plug-in hybrid follows the structure of the conventional 500 L AMG Line - featuring equipment such as 19inch AMG alloy wheels, LED intelligent light system, COMAND Online, leather upholstery and a front seat memory package.